Taubman, William (2003). 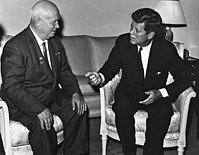 Khrushchev: The Man and His Era. W. W. Norton & Company. ISBN 978–0393051445 Check |isbn= value: invalid character (help). Service, Robert (2009). History of Modern Russia: From Tsarism to the Twenty-first Century (۳ ed.). Penguin Books. ISBN 978–0674034938 Check |isbn= value: invalid character (help).